Wondering how to finance a new car? Your Data Self can remove the speed bumps by helping find the options that suit you. Choosing a new set of wheels is a big decision. But picking car finance options can be just as difficult. There are many routes to consider. We can make it a smoother ride - by helping you shop around to pick the one that’s right for you. 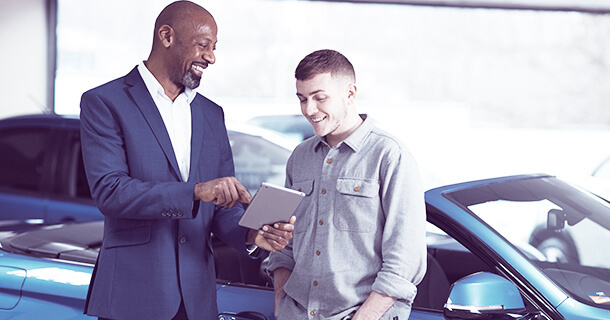 With Experian, you can check your eligibility for Hire Purchase deals, PCP and personal loans without impacting your credit score, as well as comparing guarantor loans and offers from car finance brokers. So, you’ll be prepared to pick the best deal when you head to the car dealership. So, whether you love to upgrade your motor to a shiny new model regularly, or are hoping to go steady with a car you trust, we can help you find the best way to pay. What car finance option is right for you? There's lots of choice out there. Our tool cuts through the jargon to help you make the best decision. We work with these leading loan providers and brokers.